Looking at it I think it was Ze-Epik. We've stayed at 100 threads for quite a while now. I don't think we'd ever achieve something like 7106 threads. Isn't it 101 because of this thread? Well I'm bad at paying attention. Few posts ago I found out what "original" reply page looks like. It's used for previewing comments, but if you reload the page (and lose what you've wrote so far) it will say "Reply to comment" and there will be only the first comment of the thread and form for creating your comment. Hello and welcome back in your existence! 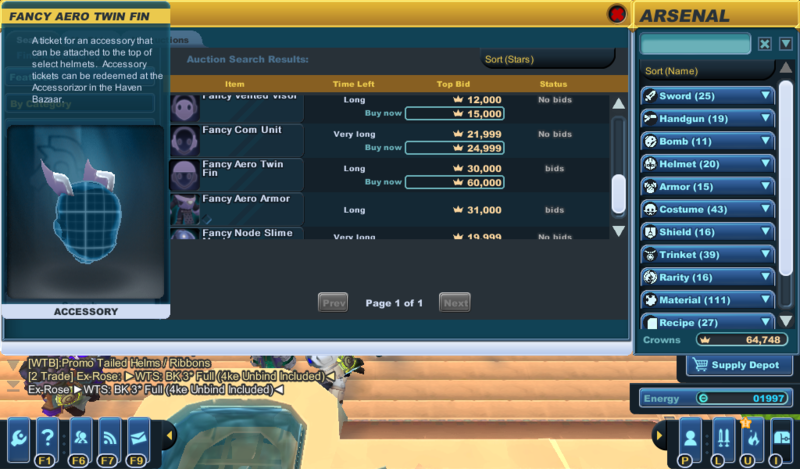 Not very long ago I found out how to open your real inventory (Arsenal) while browsing the Auction House. When you open Auction House, your inventory opens too, but some categories are missing and whenever you click on something, it will try to put that item on the third tab where you can make your auctions. And you can't press any button to hide that inventory or open the real one. So you open your character window, select Battle Sprite tab, click on the sprite's icon (as if you were going to feed it) and another inventory pops out from which you can select what do you want to feed your battle sprite with. This unlocks your true inventory. Now you only close the character window (because you don't need it anymore), open Arsenal and you can freely browse all your items, change your equipment, use confetti without closing AH etc. But seriously, you got me thinking if it really is useful. I guess its best use would be for previewing items from AH with your other equipment, but I don't know exactly how it works and if it works. I tested it and it can't be used for previewing different costumes. AH's preview window always uses equipment you had when you opened it. My relationship with AH was pretty much the same. Basically, I didn't use it at all. Then I decided to capture images of items for wiki and AH is one of the best sources for that. But I still usually don't buy anything, except making basic stock of different confetti in case I'll ever record their effects. I was confused for a minute what sentence that I wrote could be a palindrome. Luckily I fugured out what you were referring to. Here's another interesting fact from SK, this time about in-game windows: Loadouts (L) is the only window that can move character window (P). If they are going to overlap, character window is moved left. Of course, you can't see this at full HD resolution. These posting times are insane. The number's 7123. Heh, 1, 2, 3. Today was a good day. I've managed to break something again (specifically complete a sublevel in Thumper without the game giving me points and grade for finishing it, but still moving me to another sublevel). Now I broke something in Spiral. I opened Missions, selected Arcade, clicked on the last gate, clicked on Expansion and the Gate map didn't go away. Fun fact: Double Aero Fin got renamed to Aero Twin Fin. Funny, I was just thinking about Terraria. When you click on a video on YouTube and then seek to the middle before the page fully loads, does it load only first 10 seconds of the video? Because it does for me sometimes. The number's 7139. This number requires you to press all 4 corners of a num pad in U pattern. I hate how I can't decide what I should play so I just sit around and do nothing. Being productive and doing actual work would also be an option but naah. I know exactly what are you talking about. Except I open a new tab on Firefox and can't decide what page to visit. So I check YouTube like 5 times despite I know it won't show me anything that interests me. The number's 7141. Your fingers won't leave left column of your numpad when writing this number. Wound up playing Gungeon and had a very lucky run. I would have probably gotten through Bullet Hell if I had remembered to buy Pig when I had enough money. Sounds like it's enjoyable despite you can't get to the end most of the time. I got Pig in another run and got through Bullet Hell, strangely enough in both runs I managed to get two chickens. I also had another rather fun run where I got Helix Bullets, Scattershot, and Homing Bullets, meaning every time I fired a gun I was firing 6x the normal bullets and they all homed in on enemies. Also got some very good guns like Fossilized Gun (one of my favorite guilty pleasure guns because it sets everything on fire, even if that includes yourself), Black Hole Gun, and COM4ND0 (missile gun). It should also be mentioned that I managed to get Junkan and Gold Junk, which meant I was being assisted by a giant trash mech, so that's neat. This was my first world and first ever base in Terraria. I played 1.2.4.1 and I was cool. Each floor was made from different material. Images: ground floor, more floors. I started a new world when 1.3 came out and left the old one untouched to this day. This is now my largest base. In contrast to previous world, I tried to make sure every NPC has its own little house, each in different color (except the mushroom ones). Originally, my house wasn't much larger than NPC houses, but then I raised it to the sky and almost above. Up there I made one large bedroom and bathroom, but the bedroom was too large to make for valid housing. Above my house I utilized some Celestial event materials and build this. It's supposed to somewhat represent Terraria, with half-sun-half-moon (that unintentionally resembles Eye of Cthulhu) with Luminite moon in the middle and other 4 celestial moons around it. Other closely related buildings to my base include storage pyramid and section of rooms, where I tried to craft everything you can from 1 kind of ore and build entire room from it. Images: entire base, middle, bottom/banners (it's funny how it fills half of your screen with text), emblem, armory (unfinished), storage. This is my third base for abandoned expert playthrough. It has probably the most interesting shape out of them all (but no block variation). Next base is a castle. It comes from probably the most recent multiplayer world I have with my friend. I tried to make it easy to move around the castle and also make lots of openings you can jump out of and fight the enemy, what was supposed to make impression of really thought out castle. I have no idea if it was actually good or not, but I liked the idea of it. You can see roughly half of this castle, the large room being the middle. The second half is symmetrical to the first, so you aren't missing much. I think it originally consisted only of the first section (there are 3, 2 are visible on the image), but I wanted this to be home for all the NPCs, so I had to add more. It's almost finished, but misses decorations and NPCs (that decoration wouldn't be anything great anyway). This image shows how much my friend loves explosives, especially the bouncy ones (he didn't blow up the base). While exploring all the old worlds, I found one that looked like a fresh untouched world. I don't know for what purpose I created it, but here's an interesting piece of world generation from it. Whew, that was a lotta words. I guess I can't just show something without excessive wall of text explaining every little detail of it. Luckily, I don't know how much time exactly I spent writing this (probably like 2 hours).